Lucien Castaing-Taylor and Ilisa Barbash, the husband-and-wife filmmaking team behind Sweetgrass, apparently prefer the term “recordist” over the term “director.” Walking out of the theater as the end credits roll on their latest documentary, you might be inclined to agree. 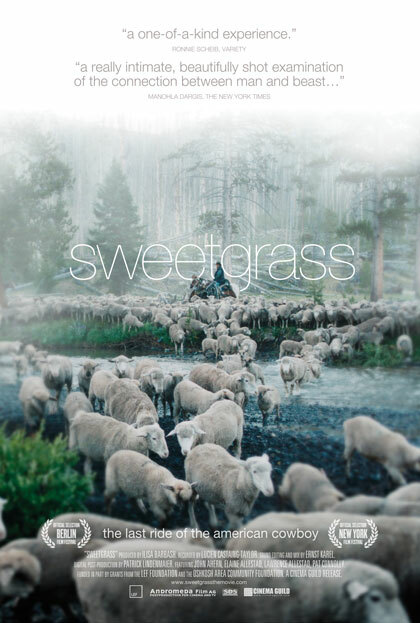 Sweetgrass is less of a manifestly researched and constructed documentary and more of a visual tone poem, patiently recording the waning days of independent, open-range sheepherding in the Big Sky Country of Montana. That isn’t to say that the film is unenlightening. In fact, it paints a vivid, intimate portrait of what life is like for today’s cowboys (or sheepboys, I guess). But the filmmakers accomplish this by doing away with such artificial elements as narration and score. There’s precious little dialogue other than some salty campfire talk, a bunch of crotchety cursing and those incessantly bleating sheep. Unlike March of the Penguins, the film doesn’t try to anthropomorphize its many non-human actors. Instead, for 100 rapturous minutes, we simply sit back and gaze at the wide blue skies and majestic green mountains of Montana. That undulating off-white stream in the middle of it all? That’s a herd of 3,000 sheep owned by rancher Lawrence Allested, which old-time ranch hand John Ahern and high-strung youngster Pat Connolly are annually tasked with guiding some 200 miles to the summer grazing grounds. Castaing-Taylor and Barbash spent three summers in Montana’s Absaroka-Beartooth Mountains pointing their cameras at this disappearing way of life. The end result is something that in no way romanticizes the life of the modern-day cowboy. Bears, wolves and god knows what else sniff around the campsite at night looking for an easy meal. With no companions other than sheep, horses and dogs, Ahern and Connolly fight like an old married couple. Boredom and monotony are constant. The physical toll is brutal. At one point, Connolly whips out his cell phone and cries to his mom about his aching knee. (John Wayne never did that!) And yet, Sweetgrass still succeeds in creating a snapshot of the fading American West that feels impossibly nostalgic and beautiful. Despite the hardships, these tough hombres labor on. Lambs are born, sheep are sheared, tents are pitched, meals are cooked. Watching a lone cowboy corral a chaotic cloud of wooly charges with a few sharp whistles and a couple of sheepdogs, you understand the graceful, almost unconscious art these men practice. That the filmmakers are regularly employed as a professor of ethnographic film at Harvard (Castaing-Taylor) and a curator of visual anthropology at the revered university’s Peabody Museum (Barbash) probably won’t come as much of a shock. Subject-wise, Sweetgrass comes across like Brokeback Mountain minus the gay stuff. Stylistically, though, Castaing-Taylor and Barbash could have been making a film about Kalahari Bushmen. Or Mongolian throat singers. It’s all about careful, quiet observation. Landscape, animals and man blur together in one inviolate chain. There’s nothing pedantic at all about the film. Viewers get to take away whatever they want: A lesson about our country’s complex food chain. An open-eyed elegy for the simple, rural lifestyle. An appreciation for hardworking, blue-collar America. A burning desire to spend the summer at a dude ranch. A renewed enthusiasm for your cushy desk job. A ravenous hunger for some rack of lamb.